Written by webadmin on 04 April 2019 . 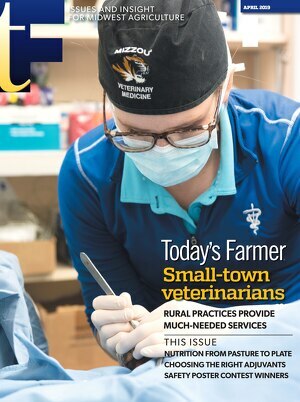 Rural practices provide much-needed services for farmers. Kids: Get off the tablet, get involved. Search is on for Century Farms. Learn more about your cooperative leaders. Inspired by her family’s health journey, Missouri cattlewoman promotes pasture-to-plate nutrition. Perryville family works to build all-inclusive playground. Proper product can increase effectiveness of herbicide applications. Fertilizing pastures and hay fields can pay off in extra forage and pounds of gain. Mountain Grove MFA adapts to changing industry. Farm safety poster contest 2019 winners. Corn: As planting starts, don’t forget to watch markets. Soybeans: Record U.S. soybean carryover stocks expected. Cattle: Herd growth likely nearing end. Wheat: Hard red wheat exports down substantially. We are accountable to you. Click HERE to read the magazine as printed via a flipbook. Created on 04 April 2019 .